Ya'll know how much I enjoy getting fun dog supply packages! 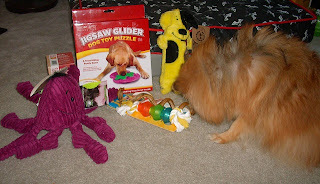 So naturally I said yes when the nice humans at Chewy.com offered a shopping spree to me. BOL! Merry Christmas to me! BOL!! 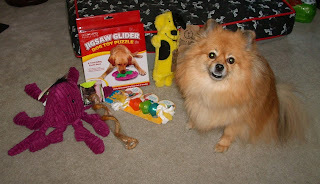 They sent me a gift code and I opened an acct at Chewy.com. It was so easy, I almost didn't need Mom's help. If only I could do my own typing! 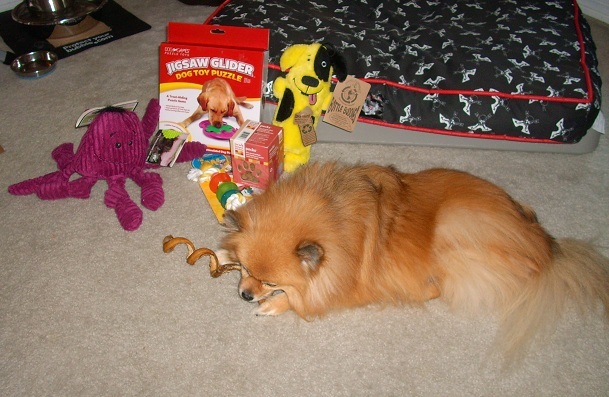 I was able to choose several pawsome items. They have a great selection, including several of my favorite brands, and they have free shipping on orders over $49.00! Mom loves free shipping! I love the fun stuff that arrives in the box! BOL!! I ordered on Thursday and my box arrived by FedEx on Tuesday! All of my chosen items were in the box, and they were all in great condition. Mom took all of the items out of the box and their plastic wrappings. She let me see and sniff them, then it was time to pose for photos. Mom, hurry up and take the picture, then unwrap that Flossie bully curl for me! After she finished taking pictures, Mom took all the toys away and wrapped them in paper. She put them out of my reach because they are my Christmas pressies. She thinks I will forget about them by Christmas day and be surprised. Yes! The Flossie bully curl is mine! All mine!! She forgets how smart I am! A week after the box arrived, I saw Mom give one of the paper wrapped toys to Baron's mom to bring to the puppy cousins' house. (Mom says it is the yellow dog bottle buddy toy that she gave to the puppy cousins.) I tried to woof her into giving the toy to me, but she didn't. Mom said that I had to wait until Christmas to get my paper wrapped toys! 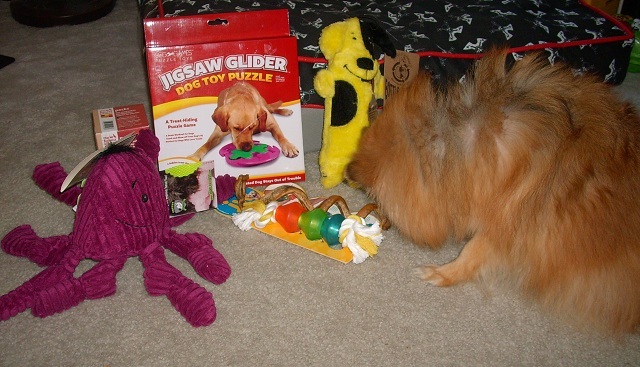 That purple squeaky Octopus looks like so much fun! There is a squeaky in each leg, and a big squeaky in the body! At least Mom let me eat the Flossie Bully curl! BOL!! 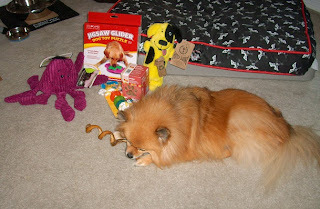 Mom let me shop at Chewy.com again on Cyber Monday! I used Mom's money this time. BOL!! Once again, I received great service, fast delivery, and all of my items in good condition. I chose standard delivery both times, so I am very pleased with the delivery speed. Chewy.com also offers subscription ordering for items you want delivered at regular intervals. I didn't test that feature because I don't consume anything fast enough to need regular shipments. Review Disclaimer: I did not receive any compensation for this review. I was given a free gift certificate for use in testing the service to review. The opinions in this review are my own and not influenced by any outsider. I receive no additional benefits for talking about the product or company. BOL! I think one of the first things I ordered online was flea stuff too! I order lots of toys too! BOL!! Thank you! I have already eaten that whole bully curl! BOL! How pawsome Pepper! It will be hard to wait until Christmas for your presents! BOL!! So true! I keep looking for those toys! Huh?? Your Mom let you SEE your Christmas presents before Christmas? I took Gretel and Chester window shopping only but will buy the prezzies on the down when they are not looking. I don't even let them see me surfing the computer. Ha, ha. BOL!!! I guess my mom doesn't have a choice. I have declared all mail is mine! Mom can have it after I sniff it. BOL! I bet Gretel and Chester will be surprised! I have ordered online greenies and shampoo but other things I go into the Petsmart in order to make sure I am getting the right size like the thundershirt and pillow. I like to try on clothes first too, but if I know my size in a brand, or if they have a measurement size chart by girth(not weight), then I will order them online. 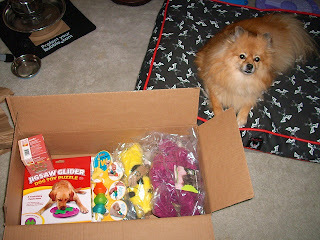 We love to order toys online! You got some cool toys there Pepper! I think Santa dropped some pressies off here for us, there is a suspicous box in the closet. Yaaay!!!! I hope you tell me all about the suspicious closet box when you open it! I think most of my toys this year are from online. BOL! I'd never heard of them before. So they're like an Amazon for dogs? Sort of. 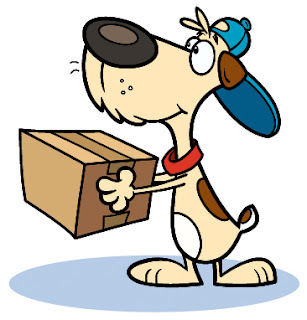 It is an online pet supply store, for both dogs and cats. :) It is one store, not several different ones like Amazon. They have pawsome stuff and furrific service!